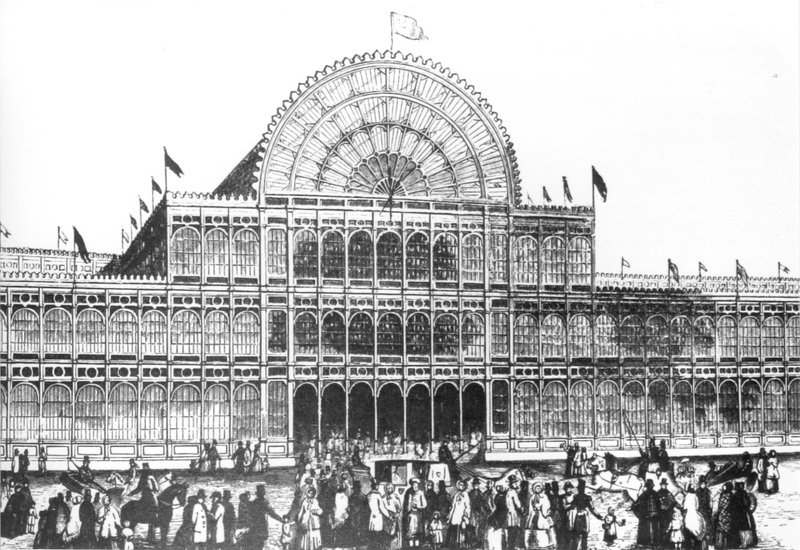 On the 1May 1851 the first world exhibition was opened in Crystal Palace in Hyde Park, London. The exhibition showed products of contemporary industrial production, above all, from the arts and crafts movement, and went down in economic and industrial history as the first and most important forum for innovations in design and technology. More than six million people visited the exhibition. 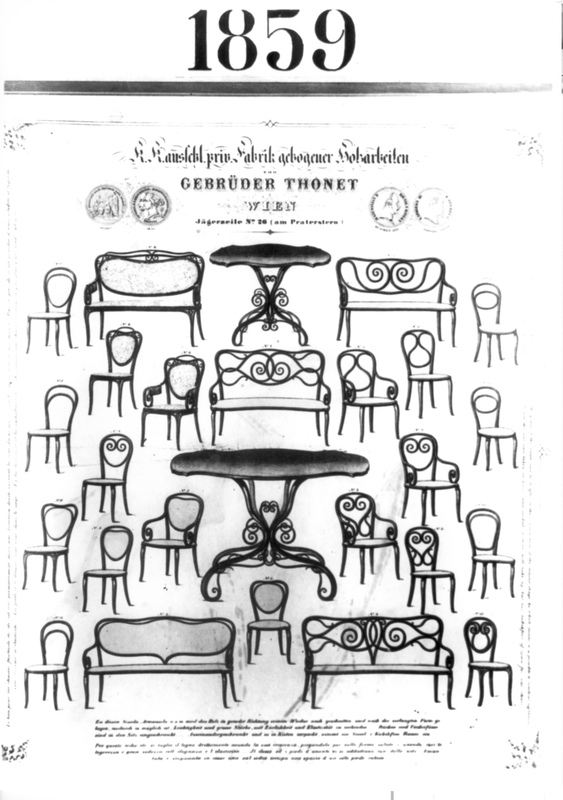 Michael Thonet started making preparations for it already back in August 1850. For the first time he showed in London an ensemble ofa chair, a bench seat and a sofa. He is mentioned in the list of exhibitors with six chair models, two armchairs, a bench seat, two tables, a sewing table as well as two reading tables and two whatnots. From the set he exhibited, he developed the later series model No. 9 and the No. 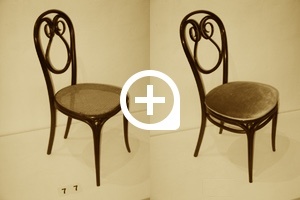 5 which was simplified in the leg construction.Thonet offered both versionsalongside each other until the mid-1870s. By 1883 at the latest the No9 was removed from the range. The furniture was and is decidedly luxurious. Thonet worked with rosewood and inserted strips of brass into almost all the parts and gave the table tops artistic inlays in tortoiseshell, brass and mother-of-pearl. The exhibits attracted the attention of the public and the critics and were widely praised. 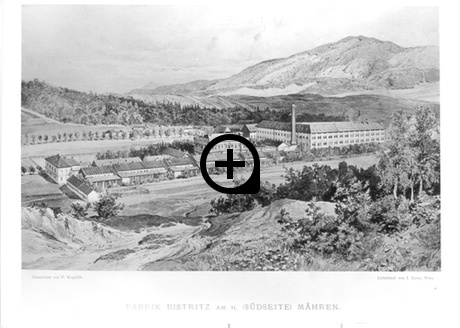 Thonet was awarded a bronze medal by the exhibition committee, the highest award for manufactured products. After the exhibition was over the furniture was bought by the architect Desvignes, Thonet’s friend and patron in Vienna, for his English country estate. 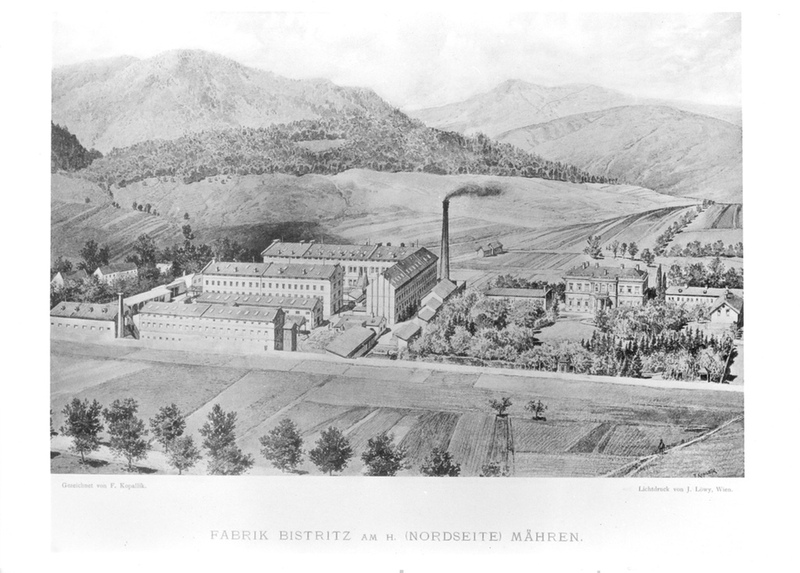 After his death in 1883, the furniture returned to the Thonet family ownership. 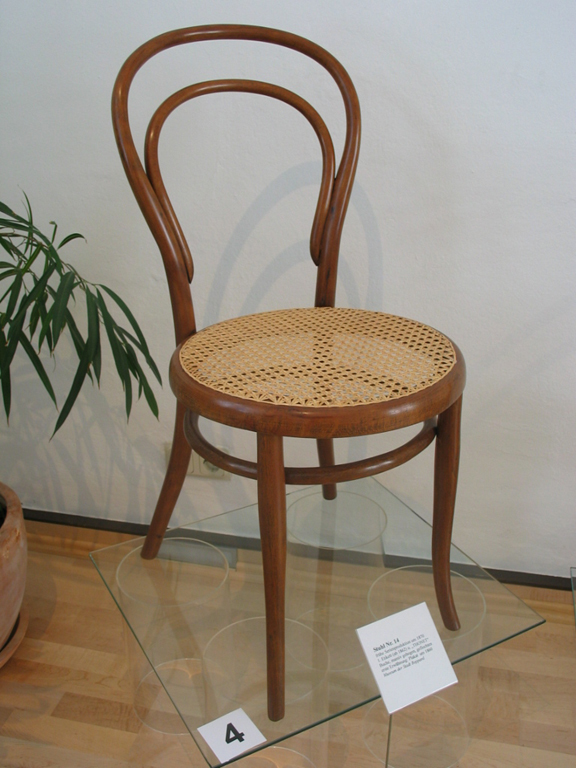 Already a few months before receiving his patent to make furniture out of bentwood, Michael Thonet took the decision to counter the lack of space and constantly increasing need for wood by opening a new factory. In the Moravian town of Koryčanyhe found a place with abundant beech forests. 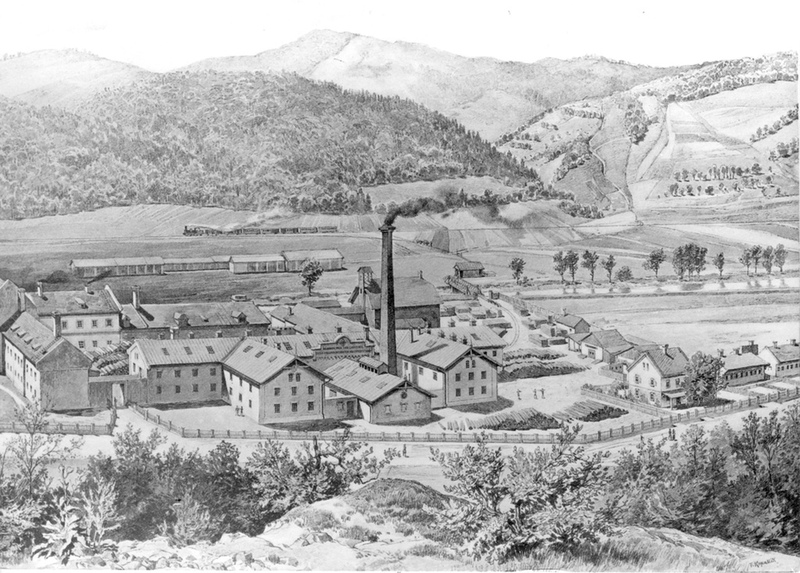 Here there werealso sufficient workers available and the nearest train station was only a few kilometres away. 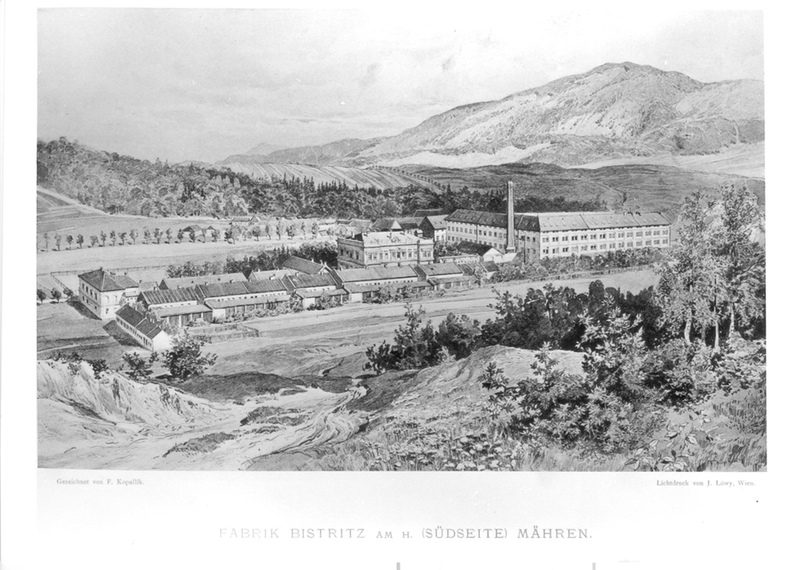 Thonet and his sons made the plans for the new factory together and supervised its building. 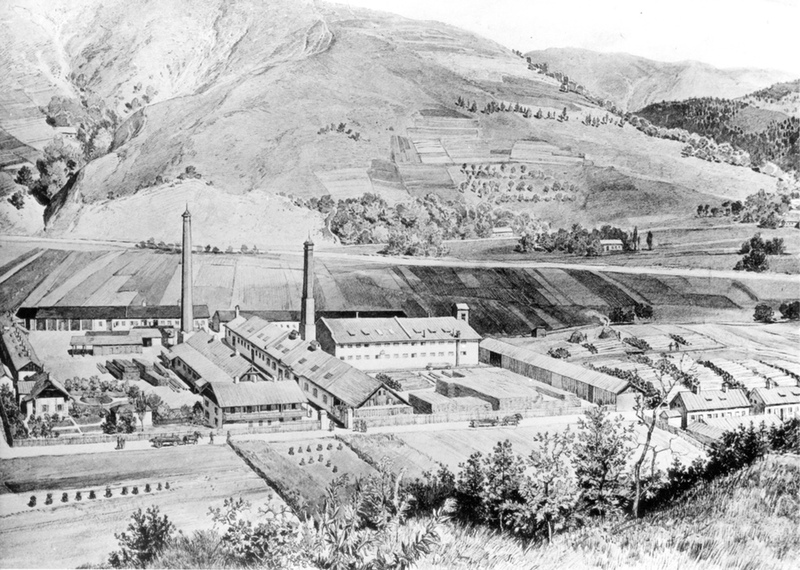 They used the experience they had gained with Carl Leistler in dealing with the self-produced wood processing machines and made the necessary machines themselves. 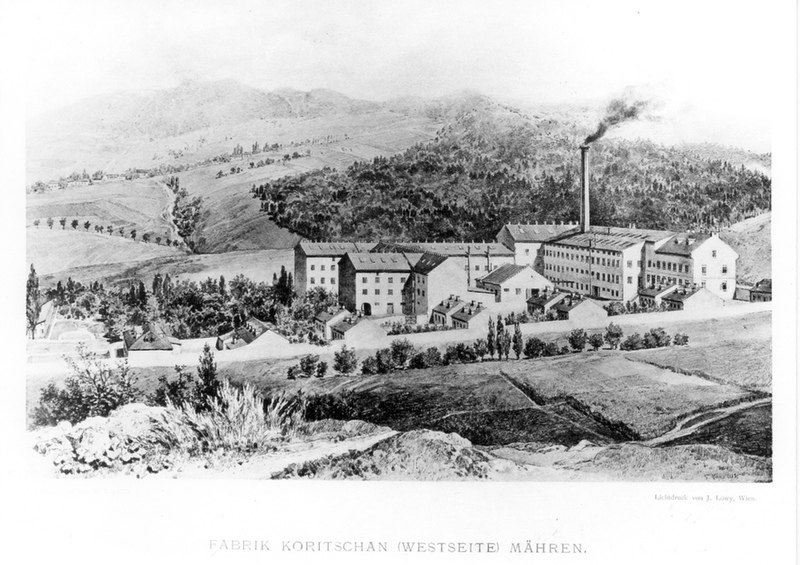 The factory was finished in 1857, so that production could gradually be moved there from Vienna. Within the next few years the glue lamination process was entirely givenup in favour of the bentwood technique. Parallel to this production expansion, several sales offices were opened worldwide. At the time of Michael Thonet’s death, there were sales offices in Amsterdam, Berlin, Brno, Brussels, Buda, Geneva, Hamburg, Hoek, Linz, London, Paris, Pest and Rotterdam. 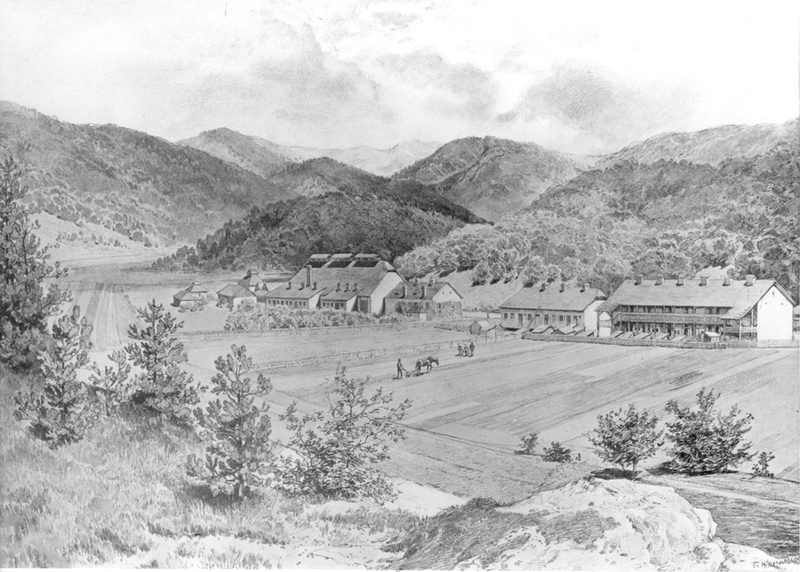 In 1873 the company had already founded stores in New York and Chicago. Parallel to this production expansion, several sales offices were opened worldwide. 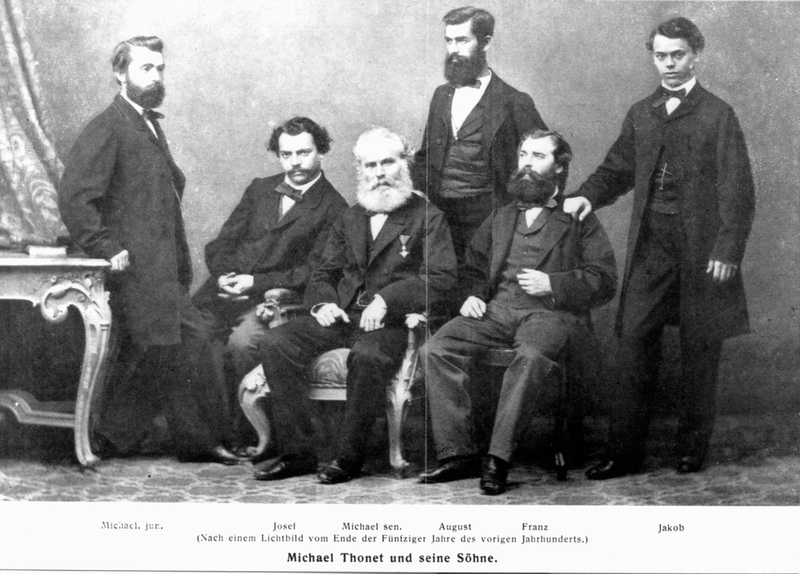 At the time of Michael Thonet’s death, there were sales offices in Amsterdam, Berlin, Brno, Brussels, Budapest, Geneva, Hamburg, Hoek, Linz, London, Paris, Pest and Rotterdam. 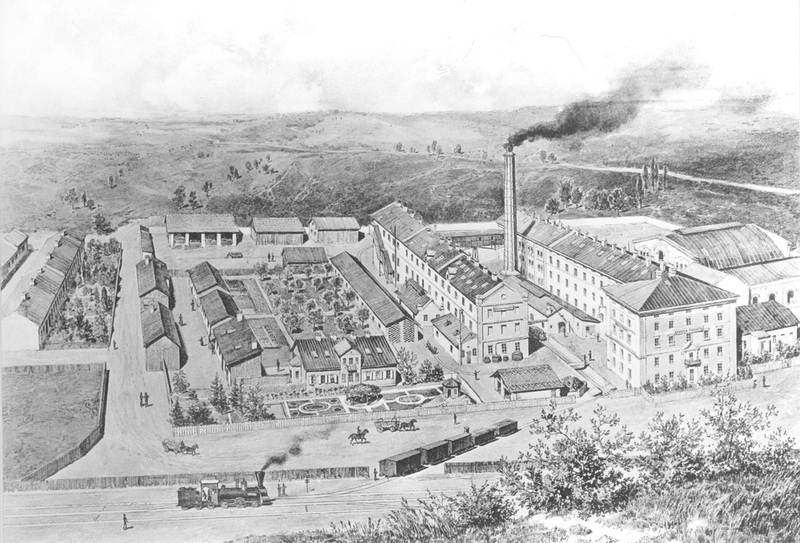 In 1873 the company had already founded stores in New York and Chicago. 14 different chairs, five armchairs and just as many seat benches as tables. Sets of furniture are formed with groups of five chairs, armchairs and seat benches which are in harmony with each other. The numbers which show what type each model belongs to are new. The typical supporting ring for the models made from solid wood was not yet used. Instead, small diagonal braces enlarged the supporting surface between leg and seat. Some models have solid front legs, which are screwed into the seat frame. Others, No. 6 and 13 still have the old ‘Liechtenstein’ leg construction with a rigid glued curved shape. The coffee shop chair No. 14 was made for the first time with screwed-on, glued wood layers to form a curved backrest. For all the above-mentioned models, individual parts were presumably made of solid bentwood. Most sections, however, were still layer-glued. The short description of the item of furniture on the poster refers to the screw fittings, the disassembly and the space-saving transport made possible because of this. 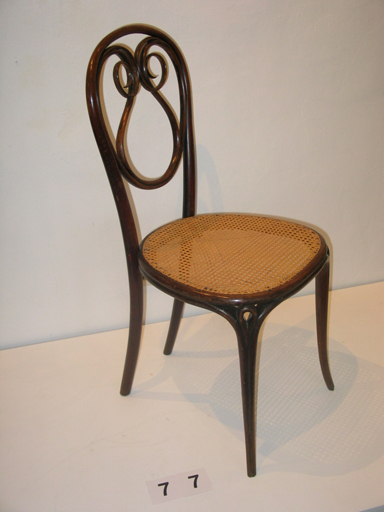 Michael Thonet died on 3 March 1871. His sons and grandsons continued to lead the business successfully. 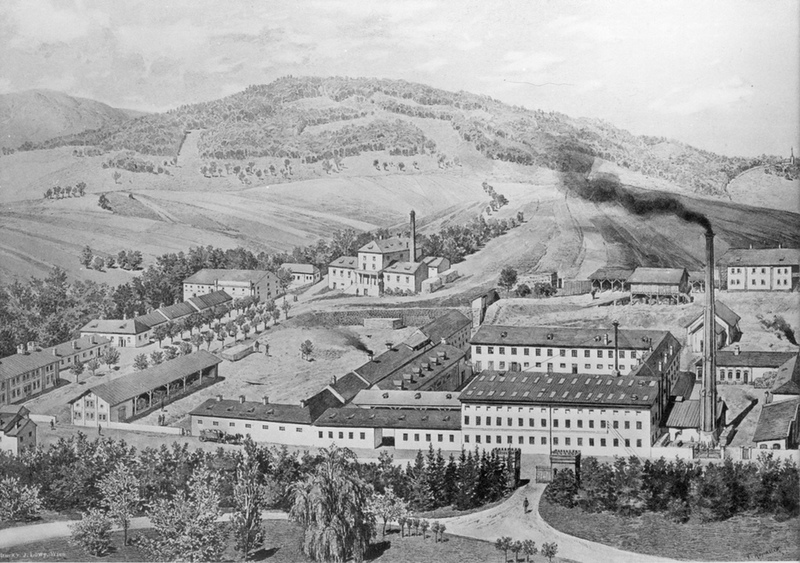 In the following years, as well as new stores, three new factories were opened: in 1872 the factory in Vsetín with two subsidiaries, in 1880 the factory in Polish Radomsko, in 1889, the factory in Frankenberg (Eder) which still exists today as well as six steam-powered saw mills and several branches in Bystřice. 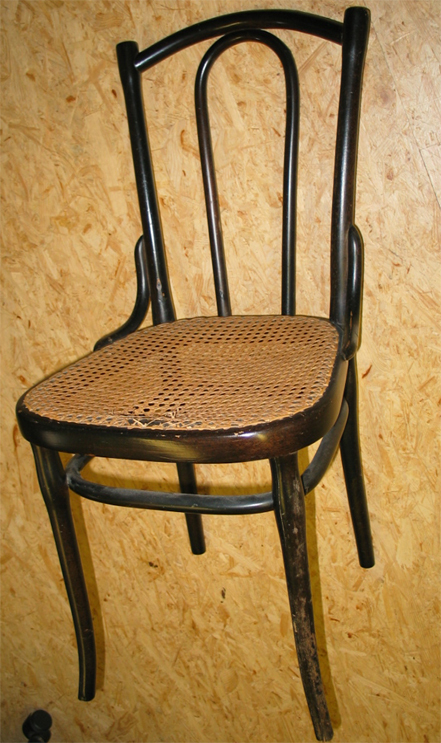 Amongst the classic chair types which went into production after 1871, model No. 18 deserves a mention, as it became a bestseller in the restaurant trade, as well as No. 14. It also caught on as the ‘South American chair’ in Latin America. A new series of simplified chair types whose rear legs and back rest consist of three parts, not one as was the case previously, were added to the range in 1886. Chair No. 56 and variations of this model were very successful. The furniture set No. 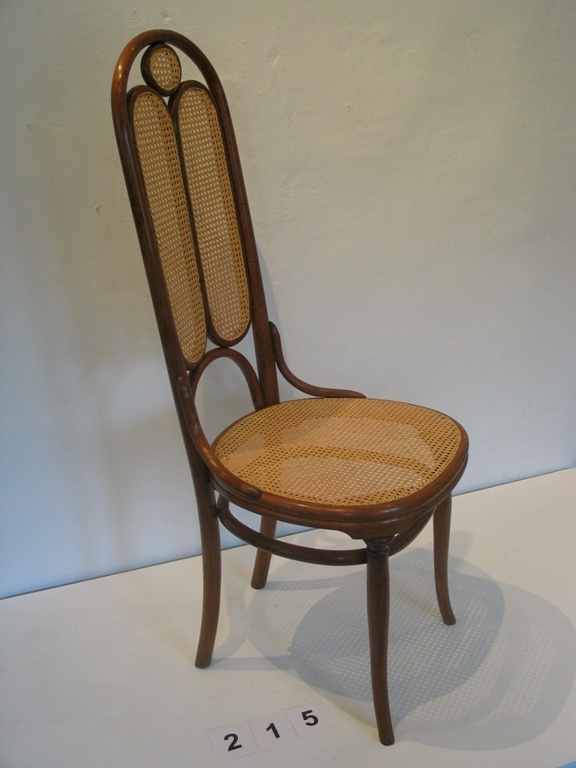 51 with its diagonally reinforced leg construction is presumably August Thonet’s design, one of Michael’s sons. In this set, his technical way of thinking is plain to see. Even whilst Michael Thonet was still alive, the construction of new machines was one of his son’s tasks. He rationalised important steps of the bending process, constructed, amongst other things, a machine to bend the seat rings and in 1877 had the first veneer wood seats made, as an alternative to wickerwork. 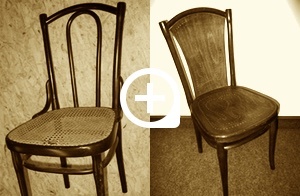 The two chairs differ from each other in two important ways: the left one has a woven seat, whilst the right is upholstered. What is more important is the fact that the right chair features a so-called leg ring. It was screwed on between the chair legs and so increased the stability. 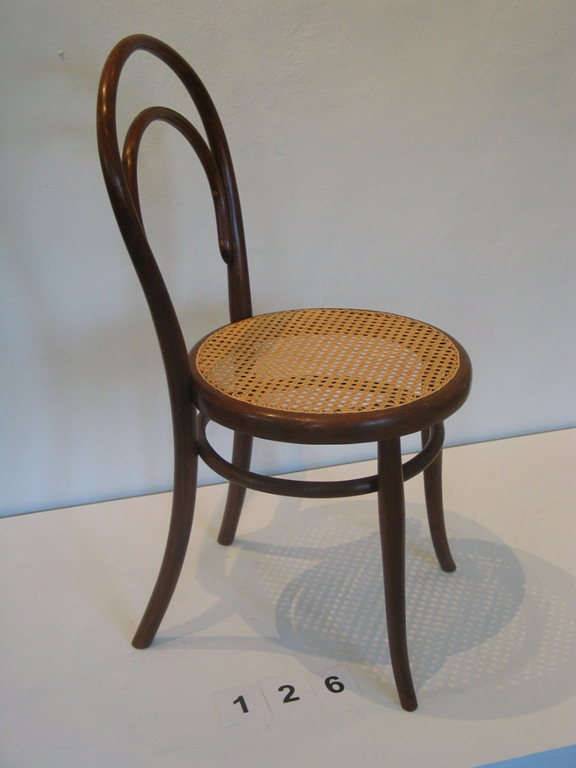 This represented an important step in the development of bentwood chairs. However, the leg ring distorted the aesthetics, so initially it was placed immediately under the seat. Only over the course of time did it ‘wander’ lower down. So from the placement of the leg ring you can tell where it is an older or newer edition. 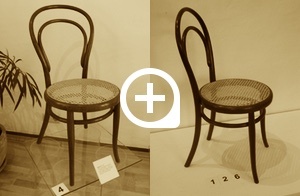 Both chairs bear the Thonet mark ‘Chair No.56’, and consist of almost the same parts in different varieties. 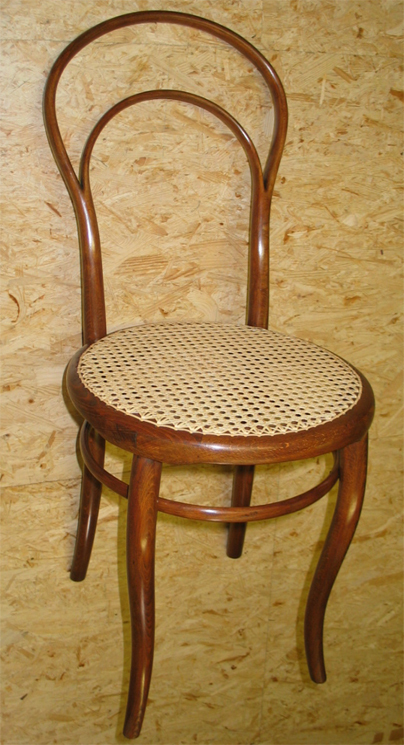 The chair BWK-T 0040 is the only one in our collection with a plywood back and seat as well a pattern of holes. It is not common. The other chair is also a No. 56 and combines the back inner part, which can be also be found on Chair No 18, as well as on others, with a woven seat. 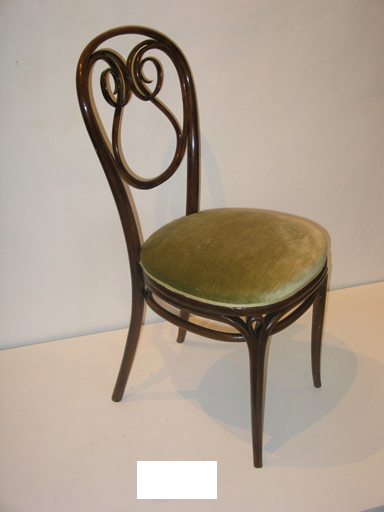 This chair is one of the few pieces in our collection, which was not made by Thonet. Yet it is one of our most valuable chairs. 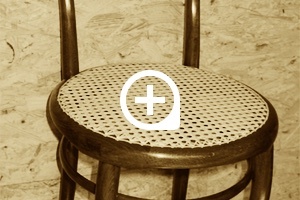 As one of the very early laminated chairs, it is similar to Chair No. 14 and still has a seat ring, made by a carpenter. It shows exactly a stage of development, which also took place in parallel for Thonet and therefore it is so important for the exhibition. Chair No. 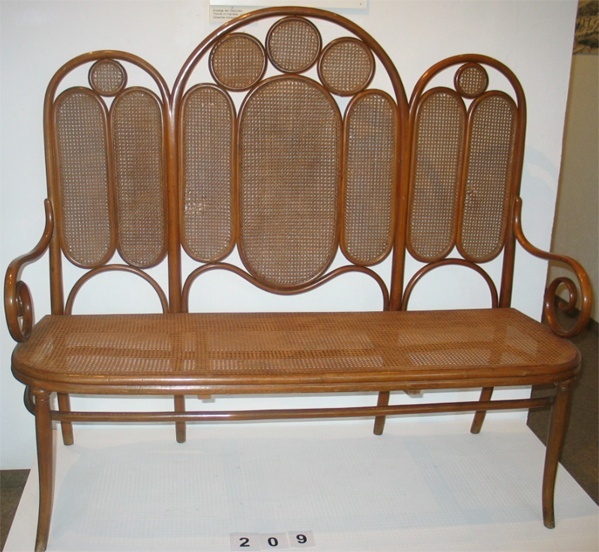 14 is probably the most well known and most widely distributed piece of furniture made by Thonet. 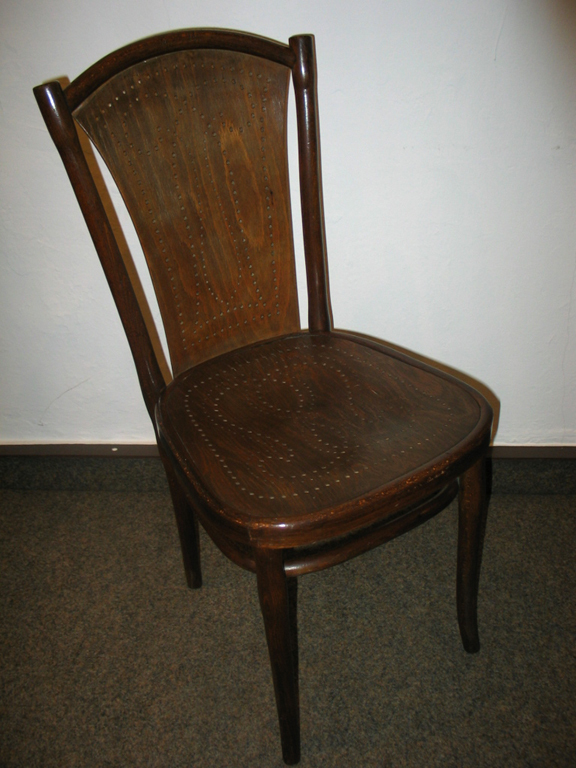 It was first produced in 1856 in the factory in Koryčany, and has a round seat ring, in contrast to all the other chairs produced before. The front legs are joined without reinforcements and the back rest is no longer nailed on, but screwed on. The leg ring was introduced in 1860/61, which solved all structural problems. This platform is consciously laid out with variations of what is probably Thonet’s most famous model: the two No. 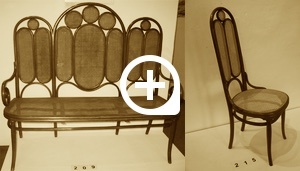 14s (BWK-T 0004 und BWK-T 0126) are both almost the same age, both are made by Thonet and yet are completely different in their design. One has been kept relatively simple and hard, the other is much more curved and so appears softer. The reason for this lies in the differing production sites, which each produced their own bending moulds, and therefore slight variances occurred. Sofa No. 16 and chair (or armchair) No. 16 with their heavy, yet prestigious design contrast with the other Thonet chairs which appear rather light in design. The shape of the back is almost reminiscent of gothic church windows. For this reason they were also called ‘Gothic’ chairs in-house.